she can quilt: Rumble - Ta Da! This is Rumble. I though of calling her Pop but she is not quite popping, more of a Rumble I think. She is about 45" by 57" after a wash and dry. There are many different fabrics in her construction, quilting cottons, shot cottons, linens and other interesting fabrics. 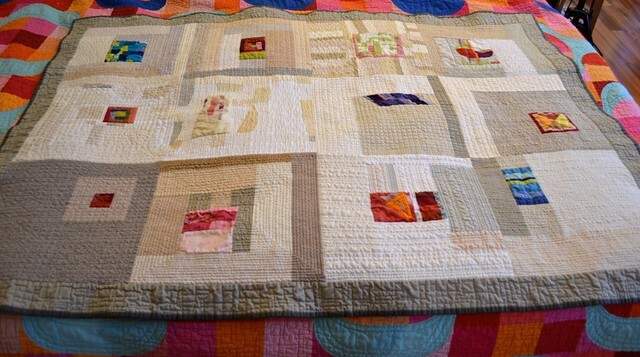 I am totally smitten with this quilt. I asked my bee mates in the Free Bee to make me 15" blocks with a small pop of improv and some neutrals in the background. They sent these fantastic blocks and then I dithered about how to make them into a quilt. I debated adding 4 more blocks, or adding just more neutrals, and in the end I settled on this simple setting with a small linen border. When she was done, I added the dark olive grey cotton binding. For the quilting, I decided to use my long arm machine and free hand lines. At first I was just going to do some all over matchstick quilting, but as I looked at the quilt on the frame, I decided that each block should have its own treatment. 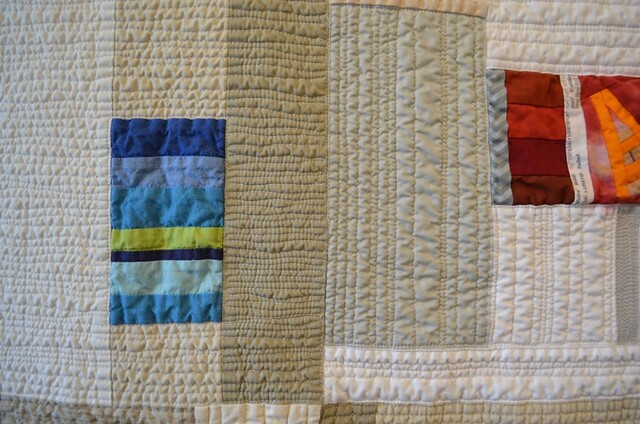 I repeated the basic quilting designs on more than one block, to ensure some level of continuity in the quilt. For the border, I did a squared off stipple effect, which I think works very nicely with this quilt. I used a Superior Threads King Tut 50 wt and then an Aurifil 50 wt in light snow and tan. I had a lot of thread breaks quilting this quilt - about an equal number with both brands of thread - clearly it was my technique, not the materials. I practiced starting the quilting mid quilt - wherever the thread had broken - and after the wash you will have to look hard to notice the location of the starts. The frame of the long arm limits some of the kinds of things you can easily quilt overall on the quilt. But these blocks were a perfect size to allow me to move in any direction without having to roll the quilt back and forth. I outlined the blocks along their edges. I am getting much better at stitching freehand in the ditch, but I'm not even close to perfect. 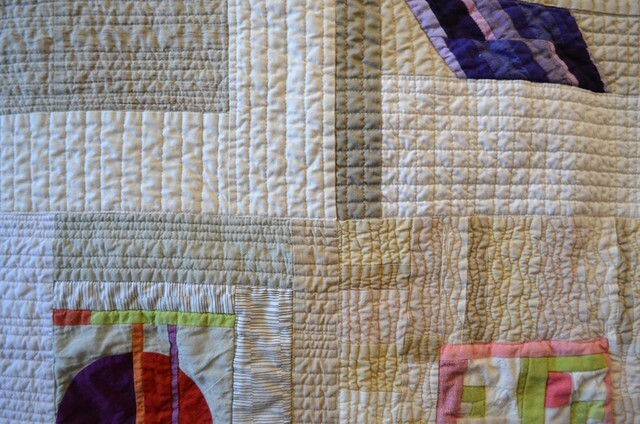 In fact, although I adore how the quilting looks, it is nothing close to technically perfect. It does not seem to matter on this improv quilt. I am hoping you want to see all the details, I think this quilt is one of the best overall quilting that I have ever done, despite the lack of technical excellence, thread breaks, wobbles and all. The modern industrial look I strive for is evident. I left the improv bits unquilted for the most part. They puff up, rumbling to the surface so to speak. I also have to say I adore the improv nature of these blocks, and the use of so many neutrals. The photo above is before I washed her. The areas of colour probably look a tiny bit better before the wash because they were not quilted. But the overall quilt improved dramatically with the wash. She was fairly stiff from all that thread and now she has a lovely drape and so much more texture. The back is pretty simple, a Paris map print and a couple of Suzuko Koseki prints that I love. 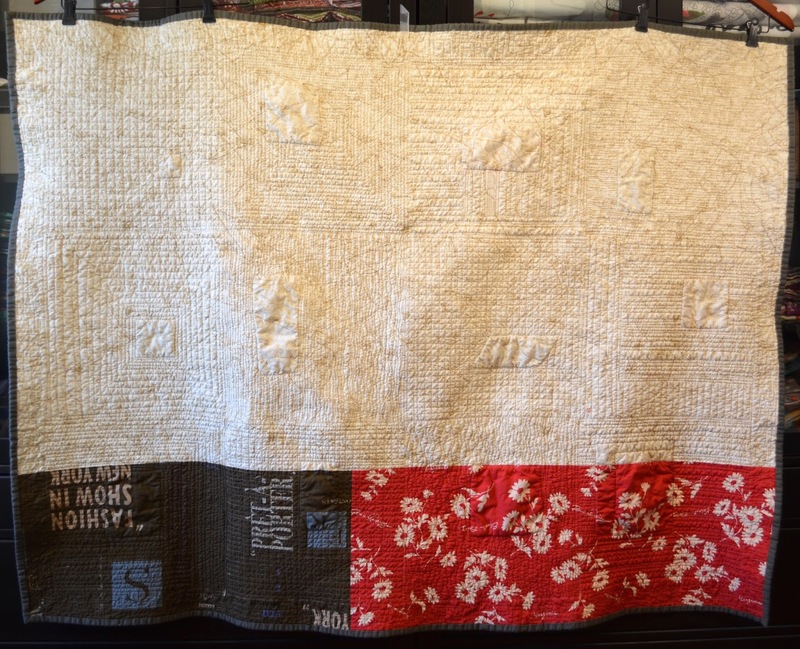 This quilt is also my first finish from my Q4 FAL list (original list is here). I know, finishing the first project on my list this weekend is a pretty poor showing on the finish side, but oh well, there will be lots of things to put on my Q1 2015 list. If I am quick about it there might be time to finish one more before the Q4 link up ends. 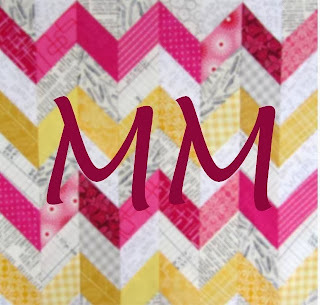 I am going to show off this finish at Aylin's Monday Makers link too. 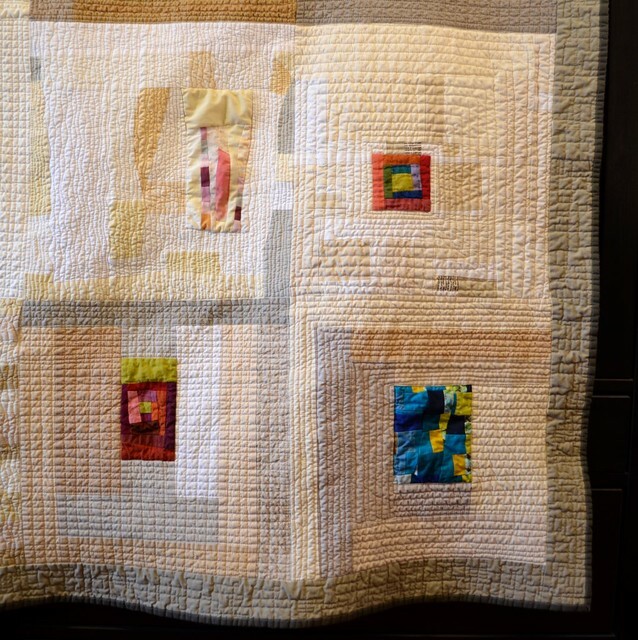 I love the way the tiny coloured pieces pop out from the neutral background, and the dense quilting gives it an amazing texture. What a great souvenir of your Bee mates. 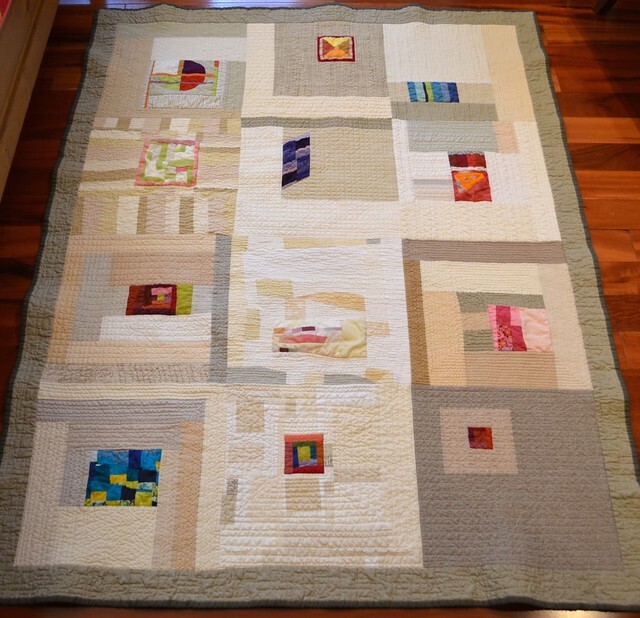 Your quilting is absolutely amazing! I love that each block has its own individual personality. Super finish. So much to love about Rumble, Leanne. 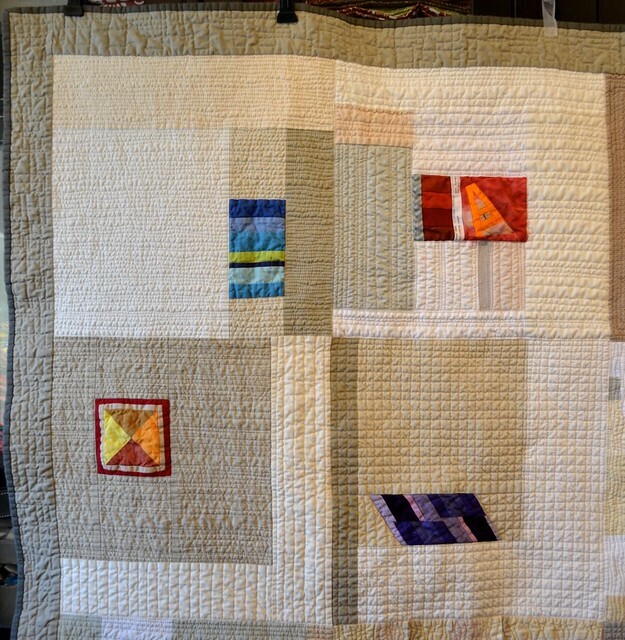 To start with I could be happy solely admiring the simple beauty of the improv and neutral combination of the blocks but then there's your quilting. I'm so amazed at how quickly you have progressed with your long arm skills. 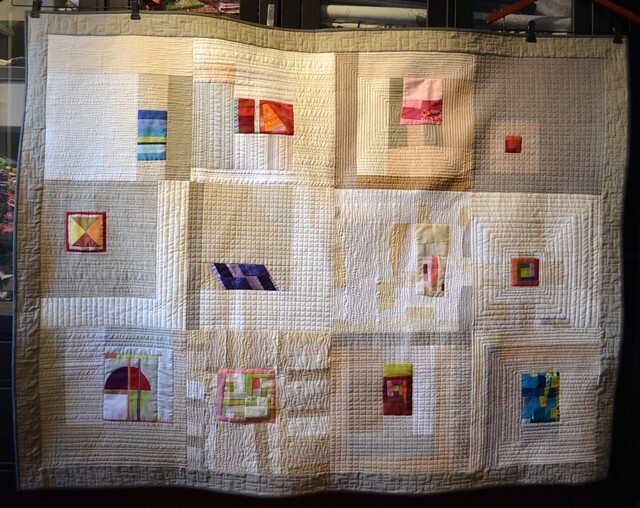 This quilt is a beautiful testament to all your hard work paying off. Bravo, for a truly fabulous finish, Leanne. Your bee mates rocked those blocks and your quilting is the cherry on top! Very nicely done - looks like a fun project for all involved. Rumble is a great name!!! Great start to a great new year!!! I just love this modern quilt - from the pops of colour in the middle of the block, the amazing range of neutrals and last but not least - your quilting! It really is a stunner. What an awesome line up of bee mates! If Rumble was a person, she would be interesting and beautiful.She is a very stunning quilt. Awesome! 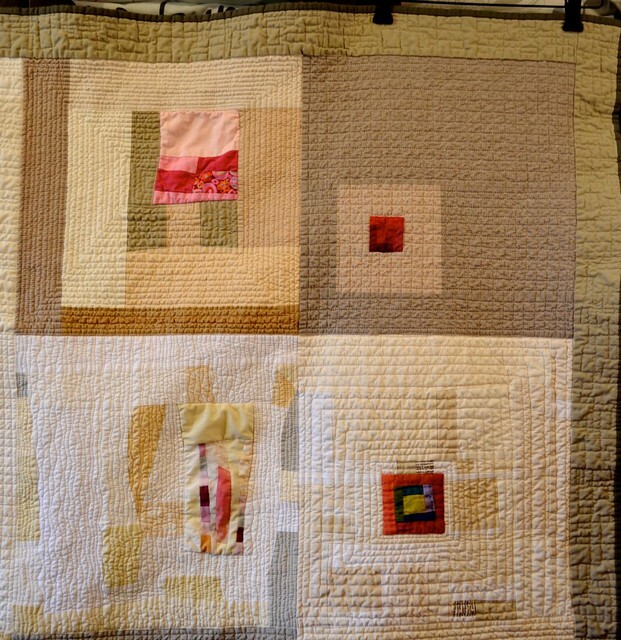 Love that quilting, Leanne! It's a great complement to the design. Happy New Year! Very pretty! I love that you left the improv bits unqulited - what a nice effect. And yay for a FAL finish! I just finished one too and need to post about it. 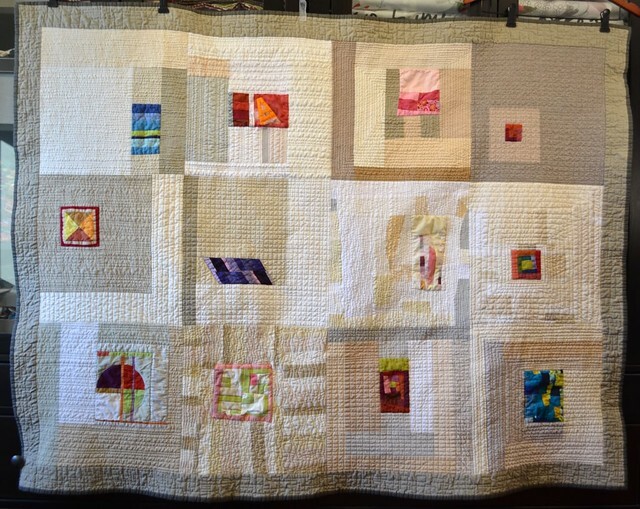 Impressive quilting, Leanne! And yay for your Bee-Partners, they did an excellent job, too! 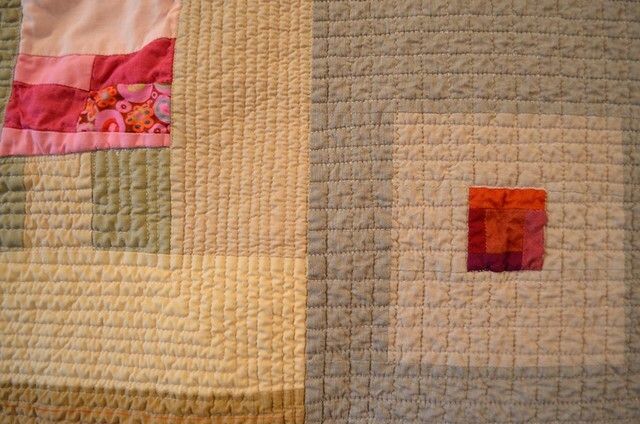 Great quilting to maintain the different personalities! I love the quilting! What a good idea to leave the colorful centers unquilted. I would not have guessed it was a bee quilt. It truly is wonderful. Congrats on a beautiful finish. Love this. Thanks for sharing all those photos! She is lovely, subtle and complex and very 'less is more'! 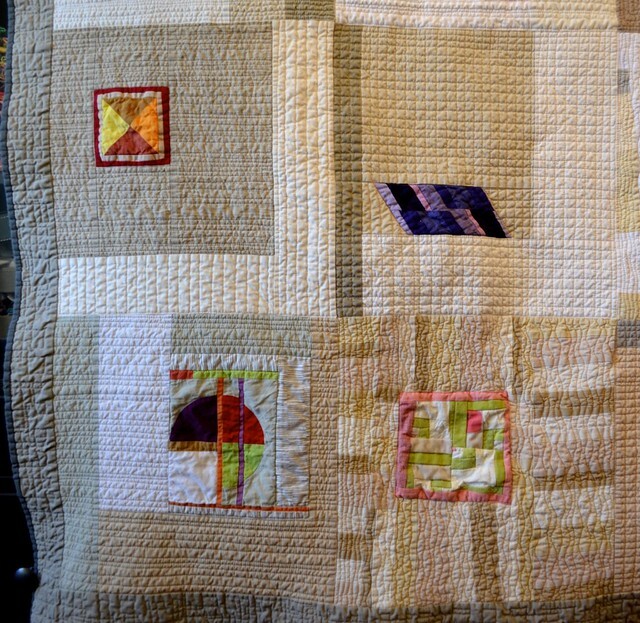 I love how you are playing with the quilting lines - added depth to each block, making each one shine. It´s fantastic - love the modernaty (haha, does this word exist?). What a great BEe-Quilt! WOW!! Very Beautiful job..everyone involved! You did an amazing job of putting the squares in, sewing, quilting and binding. Just love it! I love this ! Love the quilting as well. It is all just perfect! What a great finish! Love the little pops of color with your cream and grey. The stitching makes for fabulous texture! This is one of those quilts I could spend days looking at. Every angle and different light changes it. Oh man! Be still my heart! This is just so inspiring!! rumble on!!! Wow! just so cool! 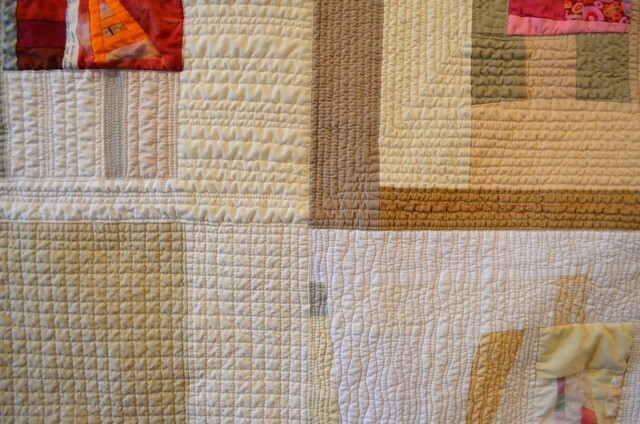 I'm in love with this match stick quilting. It must have taken you a LOOOONG time! But so worth it. Beautiful finish. OH i so-o-o love this quilt!!!! and your quilting on it, is amazing!!!! This is fabulous and you really knocked it out of the park with the quilting.